Point Pleasant senior Madison Hatfield, right, bumps a ball in the air during Game 1 of Tuesday night’s volleyball match against Cross Lanes Christian in Point Pleasant, W.Va.
Wahama senior Alexis Mick hits a spike attempt during Game 2 of Tuesday night’s volleyball match against Cross Lanes Christian in Point Pleasant, W.Va.
POINT PLEASANT, W.Va. —Lowering the boom. 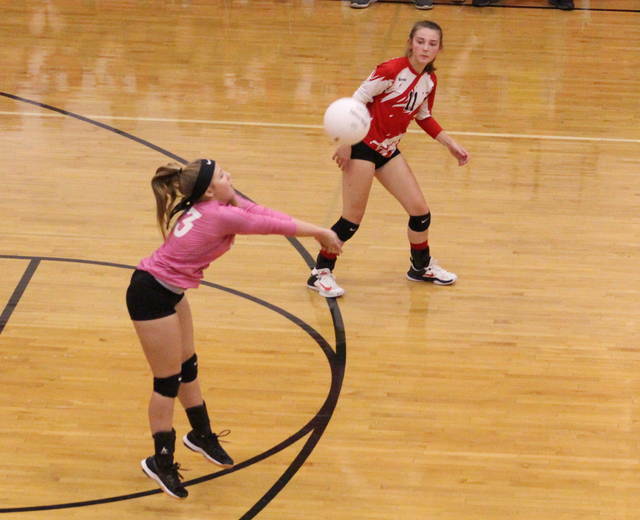 The Point Pleasant volleyball team recorded 43 kills over the course of four sets, allowing the hosts to roll to a pair of straight-game victories over Cross Lanes Christian and Wahama on Tuesday night in a non-conference tri-match in Mason County. 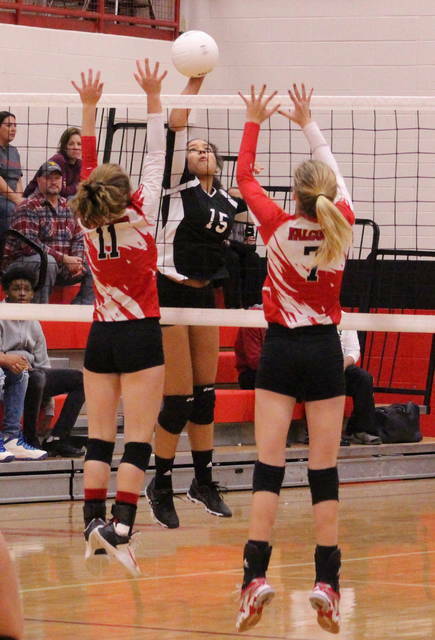 The Lady Knights (25-3) produced 21 kills in their 25-14, 25-20 victory over CLCS (22-7) in the opener, then the Red and Black churned out another 22 kills in a 25-8, 25-13 win over the Lady Falcons (2-16) in the night cap. 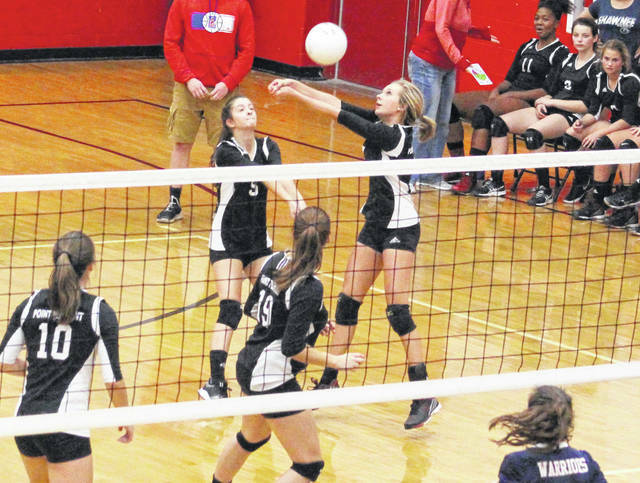 WHS also dropped a 25-7, 25-23 decision to the Lady Warriors in the middle match. Point Pleasant never trailed in the opening game against Cross Lanes Christian as the hosts stormed out to leads of 3-0, 6-1 and 10-3 before cruising to an 11-point win — their largest lead of the opening match. Game 2, however, resulted in five ties and three lead changes — and both teams held leads of at least four points. The Blue and White were ahead 13-9, but Point rallied with seven of the next 10 points to knot things up at 16-all. The Lady Knights reeled off a 5-1 run and built a permanent lead at 21-17, then made a small 4-3 run to close out the 2-0 triumph. Peyton Jordan led the PPHS service attack with seven points, followed by Katelyn Smith and Olivia Dotson with six points apiece. Haley Milhoan was next with five points and Madison Hatfield added two points, while Lanea Cochran completed things with one point. Dotson recorded three aces and Smith had two aces. Cochran and Hatfield also had an ace each for the victors. Cochran led the net attack with 11 kills and Tristan Wilson was next with four kills. 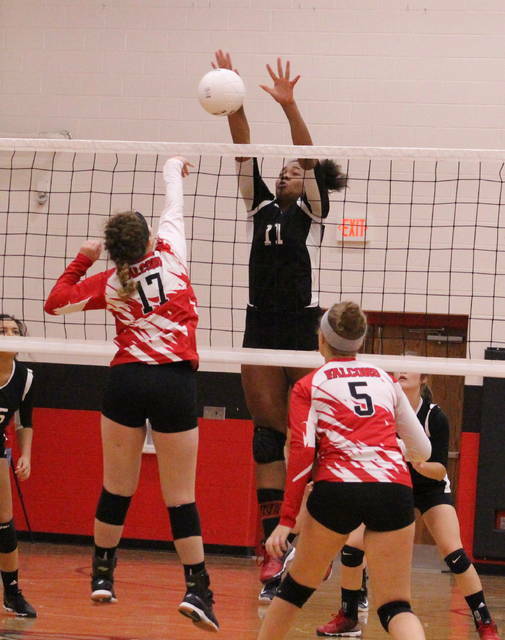 Dotson had three kills and a block, while Nancy Vettese chipped in two kills and a block. Milhoan also had one kill. Taylor Burns led CLCS with five service points and two aces, while Allie Thompson was next with three points. Thompson and Grace McAllister had three kills apiece, and Mikayla Shobe had two blocks. The middle bout saw the Lady Warriors fall behind 1-0 in the opener, but the guests rallied with 10 of the next 14 points while taking a 2-for-1 edge at 10-5. CLCS went on a 15-2 run from there and cruised to an 18-point win. The Lady Falcons fell behind by an 8-2 count early in Game 2, but the Red and White countered with a 15-7 charge that gave the hosts their largest lead at 17-15. Cross Lanes Christian answered by tying things at 19-all, then closed things out with a 6-4 run to wrap up the straight-game decision. Harley Roush led WHS with five service points, followed by Emma Gibbs with three points and Gracie VanMeter with two points. Logan Eades also had one point in the setback. Gibbs, Eades and Alexis Mick each recorded two kills, while VanMeter added one kill. Gibbs had a team-high three blocks, with Mick and Eades also contributing one block apiece. Thompson and Charity Stepp paced CLCS with eight service points apiece. McCallister led the guests with four kills and Thompson added three kills, while Shobe added a team-high three blocks. 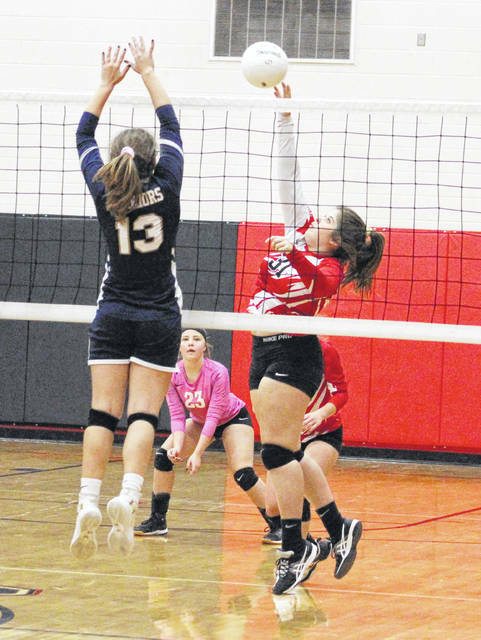 There were a total of three ties and three lead changes in the finale, but Wahama never led in Game 1 and was briefly ahead 3-0 in Game 2 before PPHS made a 6-0 run to secure a permanent edge. The hosts led by as many as 17 points in Game 1 and were up by as many as a dozen points in the finale. Dotson led PPHS service attack with 12 points and seven aces, followed by Vettese with seven points and four aces. Jordan and Hatfield were next with six and four points, with Cochran and Milhoan respectively adding three and two points. Wilson led the net attack with seven kills and three blocks, while Cochran added seven kills and two blocks. Vettese was next with four kills and Dotson chipped in three kills. VanMeter led the Lady Falcons with four service points and an ace, with Gibbs and Abby Pauley each contributing one point. Gibbs, Mick and Hannah Billups had a kill apiece in the setback. Gibbs also recorded three blocks, while Tori VanMatre chipped in one block.